Hello! Today I'm back with a few quick nail art looks using some of the polishes from the Sparklea Nail Polish Mer-Maid You Laugh collection, releasing tomorrow. 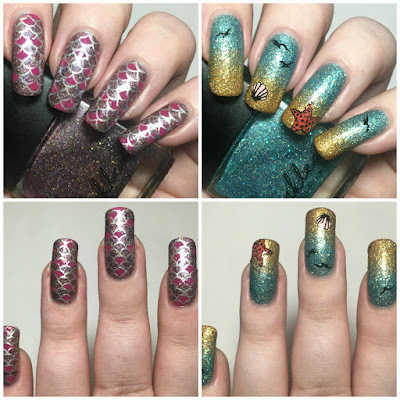 If you missed my swatches of all four polishes, you can find them in my last post here. 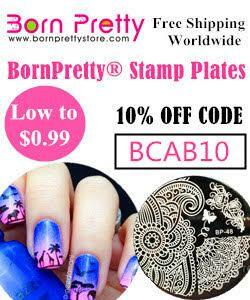 For now, let's get into the nail art! Read on for a closer look at both of my manis, and more info. 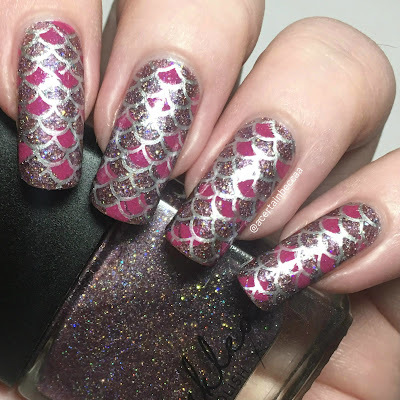 For my first look, I stamped mermaid scales over 'Hold My Pursula' (purple). I used the two layered images from the Uberchic Beauty Mermaid Life stamping plate. 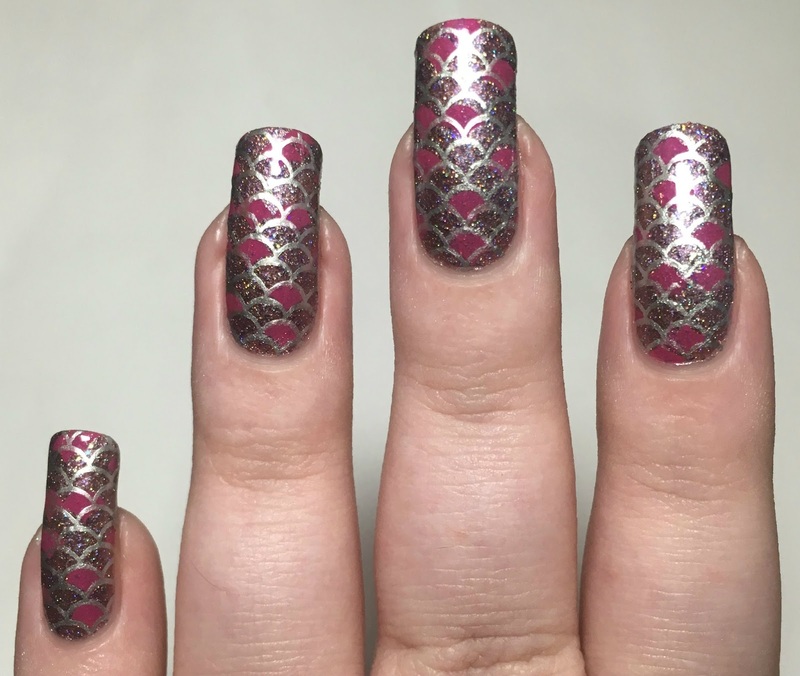 I stamped the random scale image using a Born Pretty Store pink stamping polish, and then the full outline image using Barry M 'Silver Foil'. I finished with a coat of topcoat. Can we just talk about how hard layering images actually is? My attempt clearly did not go so well! For my second look, I went for a beachy vibe. I started off with a rough gradient of 'Officially Lost it' (blue) and 'Sandy Beach' (gold), shown below without topcoat. I then added a few extra details using the Uberchic Mermaid Life plate. I randomly stamped birds on several of my nails, and also reverse stamped both a shell and a starfish. I used Hit The Bottle 'As Black As Night' to stamp, and Models Own 'Candyfloss' and Barry M 'Coral' to colour in. I finished with topcoat. What do you think? I couldn't create just a single look for this collection. I couldn't pick a favourite between the two though - which one do you prefer? They are so many options for different manis with these, especially if you stick with the Mermaid/Beach theme. I can see myself using them again and again. 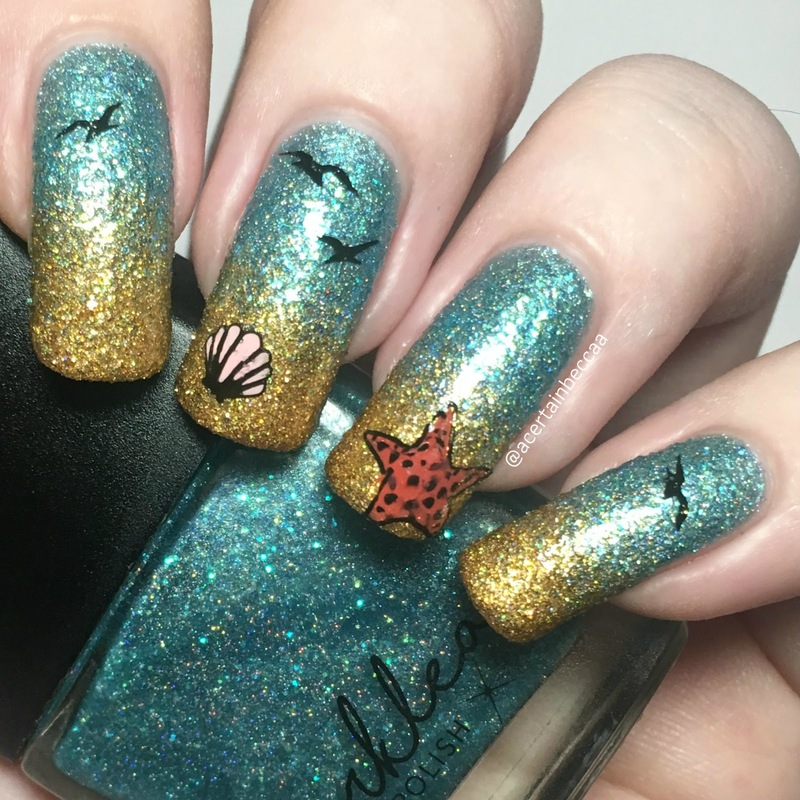 The Sparklea Nail Polish Mer-Maid You Laugh Collection releases tomorrow over on the Sparklea website here. You can find more swatches and updates on Instagram here.